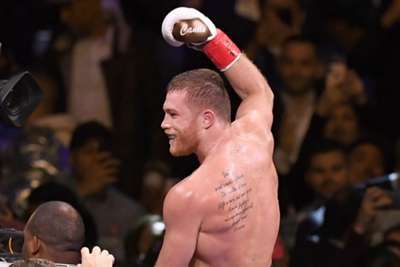 Saul 'Canelo' Alvarez did not rule out facing Gennady Golovkin for a third time after the Mexican star punished Rocky Fielding inside three rounds in New York. Alvarez became a three-weight world champion by outmuscling and outclassing WBA 'regular' super-middleweight holder Fielding via a third-round knockout at Madison Square Garden on Saturday. A pair of knockdowns in the third round, and four in total during the bout, saw the referee stop the fight in front of more than 20,000 people. Alvarez was coming off his 50th career win – a blockbuster clash against Golovkin at middleweight in September – and the big-hitting fighter did not close the door on a Canelo-GGG trilogy. "I felt that it ended on September 15 and I showed that I was best," Alvarez told DAZN in the ring afterwards. "But they were two great fights that's no secret, and if the people want it, we can make it." Fielding was a towering presence but the Englishman was no match for Alvarez – forced to his knees in the opening round after taking a strong left shot to the body. Alvarez sent Fielding down again in the second round with another body shot and it was not long before the fight was over – the brutal display ended with two knockdowns in the third. "He came to attack and that was the error he made," Alvarez said. "I did my thing in there. "That was the plan in the gym, to hit the body and move up. That was the plan and you saw it here. I feel good and I feel strong [at 168lb]. "Right now, I want the best fights. I want to make sure the name of 'Canelo' and the name of Mexico are held up high."